How Far is Supertech Czar Villas? Admittedly not for everyone, Czar Villas are the ultimate limited edition living experience. Each villa is unique and captures the spirit of independent living spaces with a blend of community living. With meticulously designed aesthetic interiors, they are the spaces so vibrant that while you enjoy the best living style, you and your family will create the best moments. Moments that you will wish like framing to adorn your wall for all times to come. And you can have all this without having to pay through your nose.As a cut above the rest, an imposing ambience of classic independent living style is present at every nook and corner of Czar Villas. They are the epitomes of comfort and convenience; they are the storehouse of luxuries. With unsurpassed landscape, spacious inner spaces and intrinsic designs, every moment of Czar Villas is worth framing. Czar Villa comprises of 3 types of villas, area of which range between 120 Sq. Yds. to 150 Sq. Yds. 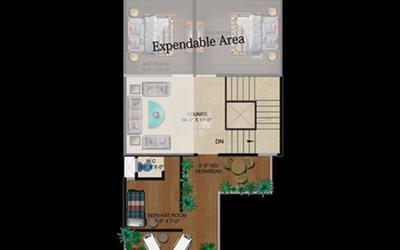 beautiful, open and artistically vastu friendly designed.